Display customer data from Nutshell in LiveChat. Our Nutshell integration allows managing customer information straight in the chat window. With it, LiveChat can display client data stored in your CRM whenever a user signs in to chat with an email you already know. Nutshell is a customer relationship management software (CRM). It enables you to store all your contact details, email conversations, and notes in one place so everyone on your team can quickly access them. The solution provides easy-to-use, customizable reports so that you can measure performance and areas for improvement. By using Nutshell, you’ll be up and running in less than 24 hours, never need an implementation consultant or a “CRM administrator”. The tool provides phone, chat and email access to free and friendly customer support and integrates with plenty of solutions and services including iGoogle, G Suite, MailChimp, Facebook or Microsoft Office. Integrate LiveChat with Nutshell and display the information about your customers straight during a chat. All that it takes is a customer's email and LiveChat will automatically load the data stored in your Nutshell CRM. With our native integration, you are just a few clicks away from gathering additional data. Check out our official tutorial and see how easy it is to integrate LiveChat with Nutshell – we will guide you every step of the way! The context gained from CRM records is key for sales and support team as they chat live with prospects. This integration provides that context right where they work - in the LiveChat app. Relevant CRM information such as a company name, the last order and a phone number is displayed directly in the chat window so you can offer more personalized service from the start. Capture leads on a big scale and strengthen relationships through live chats. 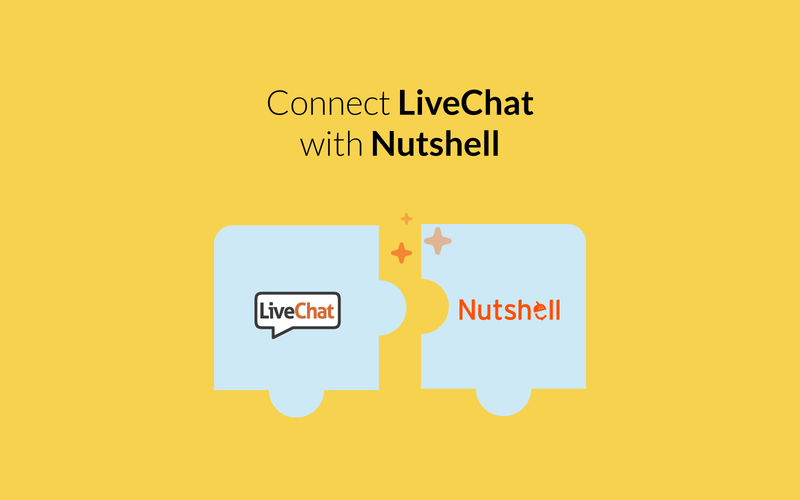 Start using LiveChat with Nutshell now!